One talking point I have been using the past year or so is that Oregon has reached “peak kids in the basement.” In other words, we have passed the peak in terms of the number of young adults living at home. Why is this important? Primarily because it signals the strength of the economy for young workers and also greatly impacts the demand for housing, apartments in particular. 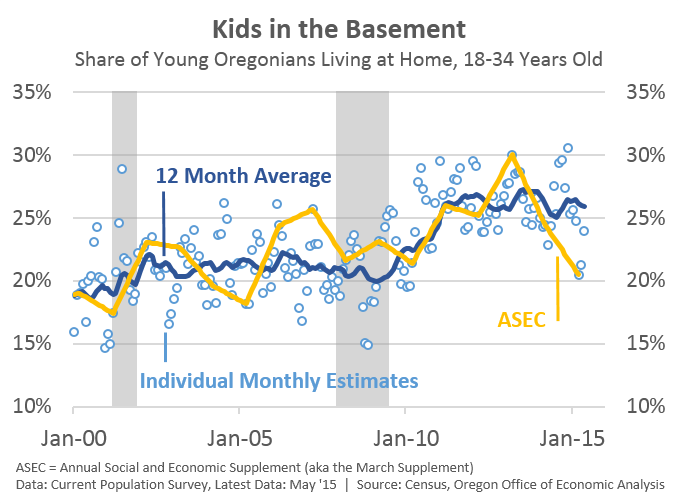 The 2015 Oregon data for the ASEC (yellow line) shows a really big decline, all the way back to “normal” rates of kids living at home. Given the sharp fall, and the fact that the ASEC is just one month of data, I went back and checked to see if the underlying, noisy data could confirm the trend. In short, not really. Although the past few months of data are lower than in recent years, the ASEC for Oregon overstates the improvement in the number of kids living at home. With that being said, I am optimistic that this will improve in the near future. Young workers are getting jobs and their labor force participation rate is picking up a bit. In fact, among the 25-34 year old group, employment rates (the share with a job) are surging today, back to pre-Great Recession rates. Based on my reading of data so far, I still think it is accurate to say Oregon has reached “peak kids in the basement” however the improvement has been relatively minor, at least so far. Oregon, and the U.S. still has significantly larger share of young adults living at home than in the recent past, amounting to about 45-50,000 additional young Oregonians today.